SU Ag Center Extension Associate for Community Gardens displays a healthy rootball during the filming of the plant propagation video on July 11, 2016 at the LSU Burden Research Center in Baton Rouge, La. 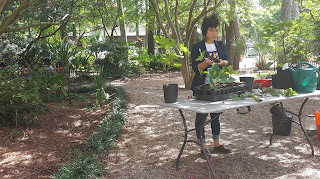 Baton Rouge, LA – A promotional and full-length video on propagating plants is available on the SU Ag Center’s YouTube channel at https://youtu.be/rOdpOOOaAkc and at https://youtu.be/X20bRpGWJXU. The two videos were produced in partnership with the SU Ag Center, Louisiana Public Broadcasting (LPB) and the ExxonMobil YMCA through the “Plant It, Grow It, Try It, Like It!” project. For additional information, contact Dr. Tiffany Franklin, Project Director or Stephanie Elwood, Extension Associate-Community Gardens at 225-771-2242. Baton Rouge, La - U.S. Department of Agriculture (USDA) Louisiana Farm Service Agency (FSA) Executive Director, Craig A. McCain reminds farmers and ranchers that they have until Aug. 1 to enroll in Agriculture Risk Coverage (ARC) and/or Price Loss Coverage (PLC) programs for the 2016 crop year. "Producers have already elected ARC or PLC, but they must enroll for the 2016 crop year by signing a contract before the Aug. 1 deadline to receive program benefits," said McCain. "Producers are encouraged to contact their local FSA office to schedule an appointment to enroll." The programs trigger financial protections for participating agricultural producers when market forces cause substantial drops in crop prices or revenues. Nationwide, more than 1.76 million farmers and ranchers are expected to sign contracts to enroll in ARC or PLC. Covered commodities under the programs include barley, canola, large and small chickpeas, corn, crambe, flaxseed, grain sorghum, lentils, mustard seed, oats, peanuts, dry peas, rapeseed, long grain rice, medium grain rice (which includes short grain and sweet rice), safflower seed, sesame, soybeans, sunflower seed and wheat. For more program information, contact your local FSA office or visit www.fsa.usda.gov/arc-plc. To find your local FSA office, visit http://offices.usda.gov. SU Ag Center Extension Associate Ellen McKnight discusses the USDA MyPlate Food Guidelines during the July 6 'Live, Learn to Eat!,' nutrition education series at the SU Intramural Sports Complex. Baton Rouge, LA – This summer, the SU Ag Center has partnered with the Southern University Intramural Sports Complex’s Jaguar FitNation Wellness initiative. The purpose of the initiative is to provide SU students, faculty, staff and alumni with activities and resources that promote healthy lifestyle changes. For more information about fitness and wellness programs at the SU Intramural Sports Complex, call 225-771-3212 or e-mail nena_verret-gipson@subr.edu. For more information about the SU Ag Center’s nutrition program, call 225-771-2242 or e-mail ellen_mcknight@suagcenter.com. Pictured from left, Deon Edwards and Ally Brown cook blueberry pancakes during the St. Helena Parish CHEF Cooking Camp, which was held July 11-15, 2016 at the Northshore Technical Community College in Greensburg, La. C.H.E.F. Camp which stands for Cooking Healthy Enjoyable Foods engaged campers in a week long cooking camp co-sponsored by the Southern University Ag Center. 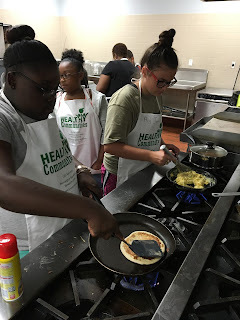 Young culinary enthusiast were able to learn about germ prevention, kitchen safety, MyPlate, and how to whip up some of their favorite fast food dishes. “I really liked the healthy chicken tenders, they were really crispy and I really couldn’t tell the difference,” said Zacharias Carey. That was the sentiment that many of the young chefs had after baking their chicken tenders in the oven. They were really surprised that you could achieve the same crispy results without using vegetable oil. “That’s our goal, we want our young chefs to understand that healthy does not mean unsavory, all of the meals that they prepared on last week were simply delicious,” said Extension Associate, Kelli Hollins from the SU Ag Center. CHEF Camp concluded with, “Lettuce-Do-Lunch.” This awards ceremony served as an opportunity to recognize all of their hard work, and a perfect lunchbreak where parents could taste what they’ve been cooking. Young chefs were also incentivized by taking a field-trip to the Crescent City Cooks in New Orleans, La. They watched as Chef Shava conducted a cooking demonstration all while telling them about Louisiana’s rich food culture. For more information on upcoming holiday C.H.E.F. Camps in St. Helena Parish, please contact Nicolette Gordon on Tuesday & Thursday at 225.222.4136. Click here to view highlights from the St. Helena Parish CHEF Camp. Article written by Nicolette Gordon, SU Ag Center Area Agent. Madison Parish CHEF Cooking Camp participants prepare to serve a meal to their guests during the camp's July 1 graduation ceremony. Baton Rouge, LA – The week-long Madison Parish Creating Healthy Enjoyable Foods (CHEF) Cooking Camp ended on July 1 with a graduation ceremony for the camps’ youth participants. A large crowd of parents and family members attended the ceremony along with Madison Parish School District (MPSD) Superintendent Benita Young, several MPSD Board Members and Madison High School faculty and staff members. Mrs. Young commended the youth for their success and shared words of encouragement to both the students and their parents. City of Tallulah Mayor Paxton Branch also congratulated the youth via phone because he was unable to attend the ceremony. An article on the camp also appeared in the Madison Journal Newspaper on June 30. The camps, with are hosted by the Southern University Ag Center in collaboration with the LSU AgCenter, are designed to teach basic cooking principles and nutrition education to youth. For additional information about the SU Ag Center’s CHEF camps, call 225-771-2242. Click here to view highlights from the Madison Parish CHEF Camp. Pictured from left, SU Ag Center Extension Associate Stephanie Elwood and Briana Brumfield are filmed during the recording of an LPB educational video on planting figs. Baton Rouge, LA – Southern University Ag Center Extension Associate Stephanie Elwood and area youth recently filmed an educational video on growing figs. The video, which was filmed at the LSU Burden Research Center in Baton Rouge, La., will be produced by the Louisiana Public Broadcasting Network (LPB) as part of the Center’s, “Eradicating Food Deserts Through the Development of School Gardens,” program. This program was developed by the Center in response to the United States Department of Agriculture (USDA) designating East Baton Rouge as a food desert. These areas are described as communities with limited access to fresh produce. The program is funded by a USDA/National Institute of Food and Agriculture (NIFA) Capacity Building Grant. The completed video will be available in the coming weeks. For information about the SU Ag Center’s Community and School Garden Program, contact Dr. Tiffany Franklin, Project Director or Stephanie Elwood, Extension Associate-Community Gardens at 225-771-2242. SU Ag Center Vice Chancellor for Extension/ LSU AgCenter Associate Vice Chancellor, Dr. Gina E. Eubanks addresses nutrition educators from both centers during the Coordinated Approach To Child Health (CATCH) curriculum training on July 13 at the Pennington Biomedical Research Center. 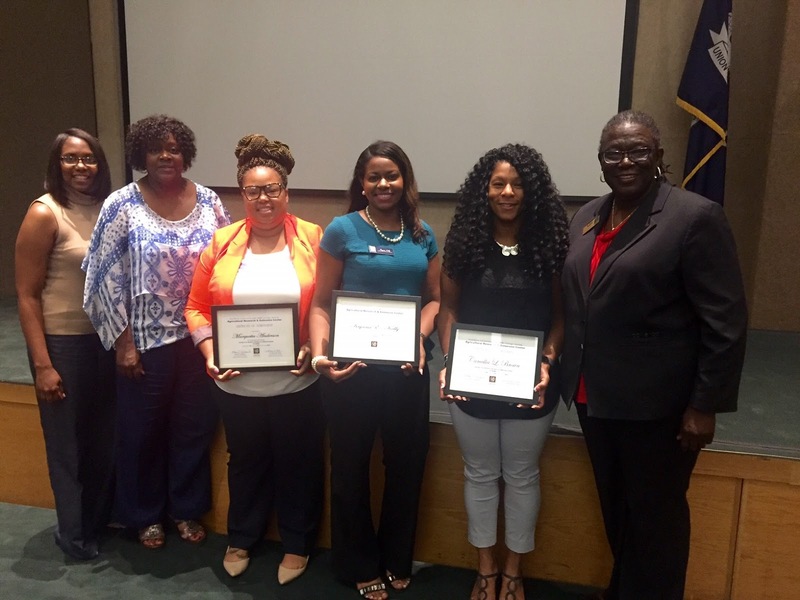 Standing from left are, SU Ag Center Extension Specialist De'Shoin York, Nutrition Education Assistant Salette Tennie, Nutrition Educators Marquetta Anderson, Kiyana Kelly and Camellia Brown and Vice Chancellor for Extension Dr. Gina E. Eubanks. Baton Rouge, LA – The SU Ag Center, in conjunction with the LSU AgCenter, convened at the Pennington Biomedical Research Center from July 12-14, 2016 for the Coordinated Approach To Child Health (CATCH) curriculum training. The CATCH curriculum is an evidence based, coordinated approach to children's health. Over 90 faculty and staff representing signature nutrition programs gathered to learn and adapt the new curriculum. The programs present included: the Families First Nutrition Education and Wellness Systems (FF-NEWS), Expanded Food and Nutrition Education Program (EFNEP), Supplemental Nutrition Assistance Program Education (SNAP-ED) and the Centers for Disease Control and Prevention's Healthy Communities Program (HCP). During the training, agents and nutrition educators from across the state were recognized for outstanding achievement in their respective programs. SU Ag Center nutrition educators Marquetta L. Anderson, Camellia Brown and Kiyana E. Kelly received awards for Outstanding Nutrition Educators. Award recipients were selected based on clientele diversity, creativity and the number of participant groups. SU Ag Center’s Salette Tennie also received special recognition for her tireless work with the EFNEP program. For more information about the SU Ag Center’s nutrition program, call 225-771-2242 or email ellen_mcknight@suagcenter.com. SU Ag Center Nutrition Educator Lisa Weber, standing on left in blue shirt, and Extension Associate Stephanie Elwood, standing far right in SU Ag Center shirt, pose with CHEF camp participants after an herb workshop on July 8, 2016 during the camp. CHEF camp participants enjoy the meal they prepared. 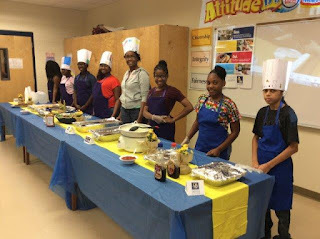 Baton Rouge, LA – Students attending the July 8th St. James Parish ‘Creating Health Enjoyable Foods’ (C.H.E.F.) youth cooking camp not only learned how to prepare a healthy meal, but also learned how to plant fresh herbs. Southern University Ag Center Extension Associate Stephanie Elwood encouraged the camp’s participants to smell and taste the leaves of the small herbs that included several varieties of mint, basil and rosemary plants. Elwood showed the students how to transfer the herbs from their small containers into larger pots that they were able to take home. Each student was also told how their herb can be cooked and consumed, as well as, the proper way to water and care for the plants. Lisa Weber, SU Ag Center Nutrition Educator for St. James and Ascension Parishes, provided the youth with instructions on preparing a pasta dinner. CHEF camps are designed to teach youth how to prepare healthy, low cost meals. The youth are encouraged to share the knowledge they gain during the camp with their family and friends to enhance healthy eating habits. For additional information about CHEF camps or to find a camp near you, call the SU Ag Center at 225-771-2242. 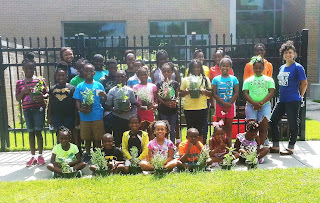 SU Ag Center Extension Associate Stephanie Elwood, standing on the far right, poses for a photo with participants of the 2016 Summer Garden Program at the Exxon Mobil YMCA. 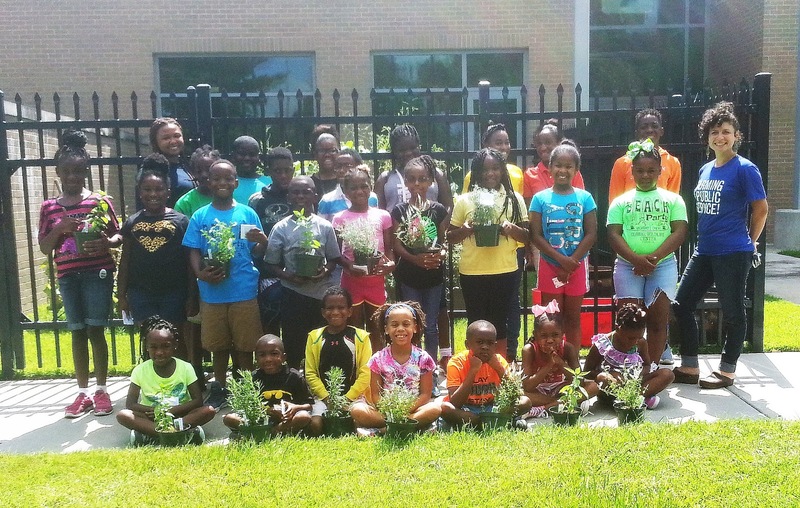 Baton Rouge, LA – The Southern University Ag Center has begun its youth Summer Garden Program at the Exxon Mobil YMCA in Scotlandville, La. The program involves growing and maintaining raised beds on the YMCA campus, harvesting and eating the produce. The program allows youth participants to experience the complete process of growing food, from planting to harvesting. Through this unique opportunity, the United States Department of Agriculture/National Institute of Food and Agriculture (USDA/NIFA) funded, “Eradicating Food Deserts Through the Development of School Gardens” program, youth are more active during summer months and the, “Plant it, Grow it, Try it, Like it,” concept is reinforced and encourages youth to try new, fresh fruits and vegetables. Weekly activities include basic garden maintenance, herb workshops, and preparing food from the garden such as refrigerator pickles. Klub K.I.D. founder Bill Summers (standing second from left) poses for a photo with SU Ag Center Senior Research Associate Mila Berhane (in green shirt), Extension Associate Stephanie Elwood (in SU Ag Center shirt) and camp participants. Baton Rouge, LA – The Southern University Ag Center partnered with Bill Summers’ KLUB Knowledge, Independence, Determination (K.I.D.) to assist with its 2016 Summer Camp. The camp was held in Darrow, La. from July 8-10. The focus of the camp was to provide an opportunity for New Orleans inner city youth to experience rural America. Activities included music and dance classes, horseback riding, a nature hike, planting a raised bed garden, camp fire drum circles, hip-hop recording sessions, vocal lessons and basketball tournaments. SU Ag Center Extension Associate Stephanie Elwood and Senior Research Associate Mila Berhane provided technology assistance with the raised bed gardens. KLUB K.I.D. was established by Summers to teach high school students how to start their own entertainment companies and learn how to protect them intellectual property. The students are required to go through every step of starting a record company from filing articles of incorporation with the city and state to establish an LLC, signing a recording contract, arranging and recording their music, creating labels and artwork to shrink-wrapping the CDs. For additional information about Klub K.I.D., contact Bill Summers at 504-319-1894 or via e-mail at Bilsum10@yahoo.com. For information about the Southern University Ag Center’s horticultural programs and events, contact the Ag Center at 225-771-2242 or visit our website at www.suagcenter.com. Southwest Center for Rural Initiatives Summer Camp participants read their poems during the center's awards ceremony in Opelousas on July 7, 2016. Baton Rouge, LA – The Southwest Center for Rural Initiatives (SCRI) held an awards ceremony on July 7 to celebrate the end of its five-week summer camp. The annual camp themed, “Welcome to the Fantastic Voyage,” provided some 95 St. Landry Parish youth with various workshops on the topics of: Arts and Crafts; Science, Technology, Engineering and Mathematics (STEM); Healthy Living; Creative Writing, Reading, Leadership/Citizenship and Youth Gardening. During the ceremony several of the youth read original poems written during the creative writing/ poetry workshop, presented science fair projects and discussed what they learned about themselves during the leadership/citizenship workshop. The camp’s staff also discussed the educational field trips and tours the students were provide with to the apple store, public library, skating ring, Opelousas Museum and Interpretive Center and the Southern University Ag Center’s annual Family and Youth Expo. Camp participant Chassidy Fontenot said she enjoyed the summer camp and the opportunity it provided her to attend the SU Ag Center’s Expo. “It (Expo) was awesome,” explained Fontenot. “We were able to stay overnight in the college dorms at Southern University and attend workshops. The workshop that stuck out the most was the one that 19-year-old business owner Hayley Thompson presented on how she started her own bakery as a teenager. The information encouraged me to want to start my own business one day,” she added. Guillory went on to explain that the camp’s participants also participated in the parish library’s summer reading program, in fitness workshops and learned to read food labels. “The students were interested in reading the food labels of Pop-Tarts and Oreo cookies,” laughed Guillory. “But it’s important that they are learning to read the nutritional value of food at a young age,” she said. Guillory also noted that the students were excited about starting a garden. Saying that she remembered one of the 16 year old’s telling her that he had never planted a seed in his life. The camp’s garden provided him with the opportunity to plant a seed and see the results of his labor. “I think the garden gave the students a chance to see that they can plant a garden at their homes and the seeds will grow,” said Guillory. Many of the participant’s parents and grandparents attended the ceremony and were impressed at what they saw. “From attending this ceremony, I can see how the program, its workshops and activities have been very beneficial to my five children,” said Johnny Fontenot. “If the SCRI will accept them, I look forward to having them in the program again next summer,” added Fontenot. “The camp was exciting, fun-filled and I think we have them motivated for the upcoming school year,” said Guillory with a smile. The SCRI is a satellite campus of the Southern University Ag Center. Located in Opelousas, Louisiana, the center serves the 10 parishes of: St. Landry, Lafayette, Vermilion, Acadia, St. Martin, Pointe Coupee, Avoyelles, Beauregard, Allen and Evangeline. To view highlights from the awards ceremony, click here.